Carbonyte Fog Sealer spray application at John Wayne Airport's main runway. Night cure and runway open before 6am. 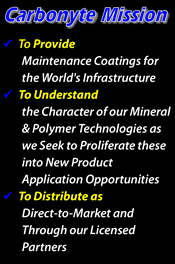 Carbonyte Systems, Inc. is in the business of designing and manufacturing specialized coatings for the world’s infrastructure, while proliferating our understanding of the character of our mineral and Polymer technologies into new product application opportunities. Our research and advances in coating’s technology have produced our newest line of Aviation Inspired sealers. Carbonyte H-25 Atomized Slurry: High Performance, Fast Drying, No Tracking, Long-Lasting fog seal and a major improvement over GSB-88. Carbonyte H-25 is tough and sprayable through a distributor truck, and this micro texture surface treatment has the fastest “Return-to-Service” available in the industry! CarbonSeal-FR FAA Fuel Resistant Sealcoat (ASTM D2939): Finally a Green & asphalt compatible coal-tar alternative. Typically used as a mineral filled sealcoat to meet the FAA specification for Fuel Resistance, CarbonSeal-FR can also be made to suit as an un-filled sealer spray-applied through a heated distributor truck. Carbonyte-FP Fuel PROOF sealer: As the newest member of the Aviation Grade sealers, Carbonyte-FP has not only met, but has surpassed the fuel proof standard we expected of this sealer. For a truly Fuel PROOF liquid sealant, Carbonyte-FP protects the pavement below from jet, diesel and gasoline fuels to motor and hydraulic oil spills. Amazingly tough and durable, Carbonyte-FP is the ultimate in pavement protection. With the right pavement profile restoration completed below, Carbonyte-FP as a top coating will protect your pavement so all you will need to finish cleaning up your spill is a towel/absorbent pad. No chemicals or other harmful products to used or exposed to the environment. Carbonyte Systems Inc. has been in the pavement maintenance coatings industry for well over a dozen years and been the innovation leader in design and creativity. When it comes to airports and the aviation industry, Carbonyte has brought the most innovative products to the asphalt pavement maintenance coatings industry with our newest shining star, Carbonyte-FP: Fuel PROOF pavement coating. Carbontye has the Right Stuff for your pavement! You may not need to be a Rocket Scientist to be in this industry, but that just happens to be our technology! For more than a decade, industry applicators and property owners recognizing the inherent health problems associated with coal tar based sealers have searched for a more user friendly, qualified replacement. In addition to the industry, public agencies are aware of the cancer causing ingredients commonly identified as Polycyclic Aromatic Hydrocarbons (PAH's) and have gone as far as to ban the use of such products containing these chemical compounds, as found by the U.S. Geological Survey's 20 year study, to be contaminating local watersheds. Can there be a sealer free of such harmful ingredients? YES! CarbonSeal-FR and our entire Carbonyte line of sealers qualify! Carbonyte is also a Heated Distributor Truck Applied Fog & Slurry Seal as a MicroTexture Surface Treatment with the Fastest Return-to-Service available in the industry today! Carbonyte Liquid Sealant is filled with an engineered hydrocarbon additive which is an asphalt derived, emulsified, high molecular weight thermoplastic. It exhibits a high softening point, good low temperature ductility and excellent hydrolytic stability to a broad range of emulsion systems including; (trackless) tack coats, fog seals and seal coats. YES! Recently, a Carbonyte HB(Hard Base) sealant was formulated to eliminate PAH's within it's chemical make-up while proving to maintain or improve characteristics versus that of a coal tar sealant (FAA fuel resistance, scrub test longevity). Initial independent lab testing of this formulation displayed no detectable PAH's!